Army of Darkness is a 1992 American horror-comedy film directed by Sam Raimi and starring Bruce Campbell. In this third installment in the Evil Dead franchise, Ash Williams is trapped in the Middle Ages and battles the undead in his quest to return to the present. 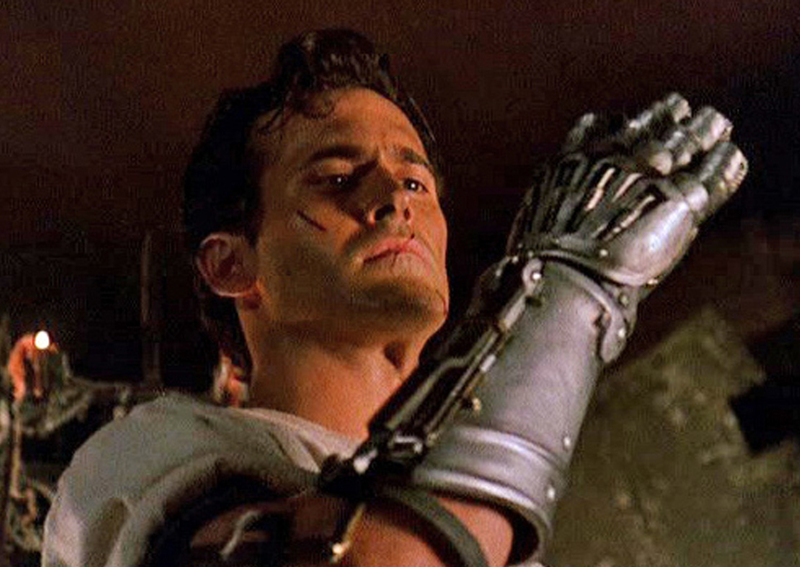 I was commissioned build Ash’s mechanical hand from the movie Army of Darkness. This was a fun one to build as I love this movie too! 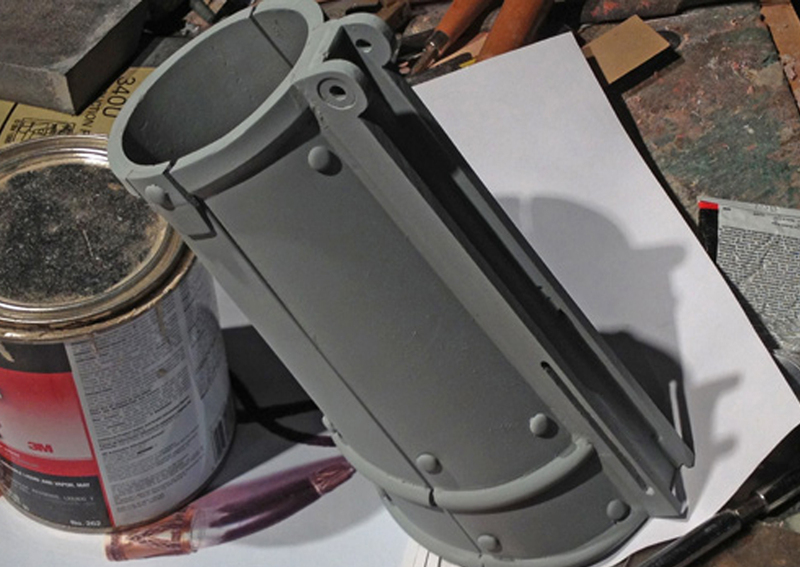 I started the vambrace (part that covers the forearm) by lathing a MDF master that roughly matched my forearm. I heated thick styrene and wrapped it over the form. Once I had both halves formed, I taped them together and trimmed the ends to the proper length and angle. I riveted hinges to the inside of the vambrace. Unfortunately it caused too much of a gap and it only allowed limited range of movement when you open it. I eventually popped them off and mounted them to the outside. 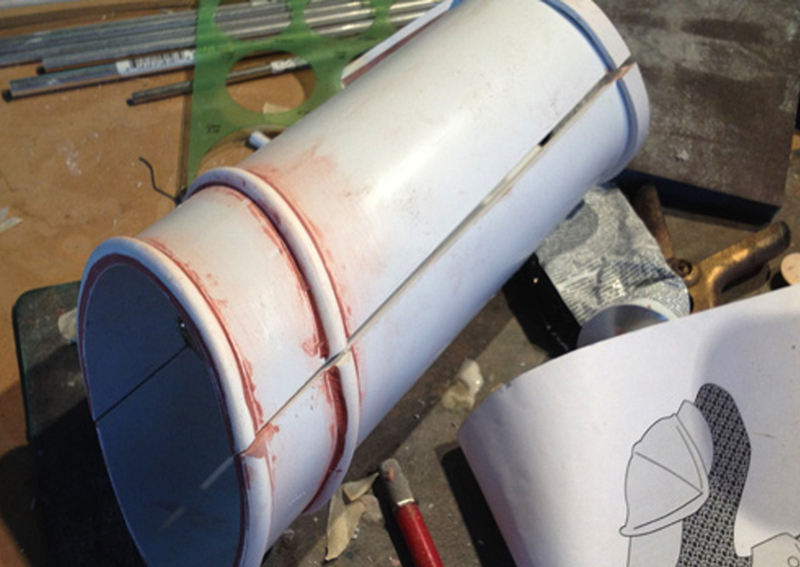 I needed very thick half round piping for the edges of the vambrace, well beyond what’s commercially available. 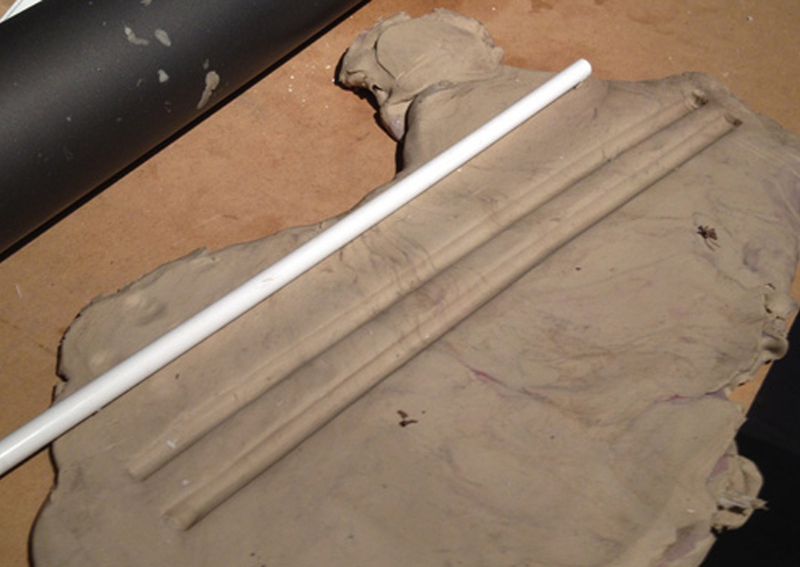 I took a plastic tube of the proper diameter and pressed it into some clay for a temporary mold. 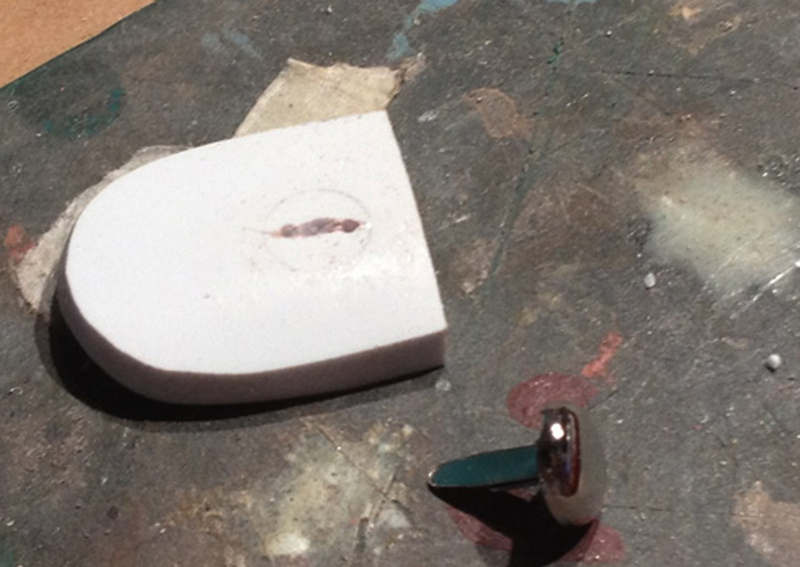 I poured some SmoothCast 65D into the temporary mold and a few minutes later I had my half round ready for mounting! 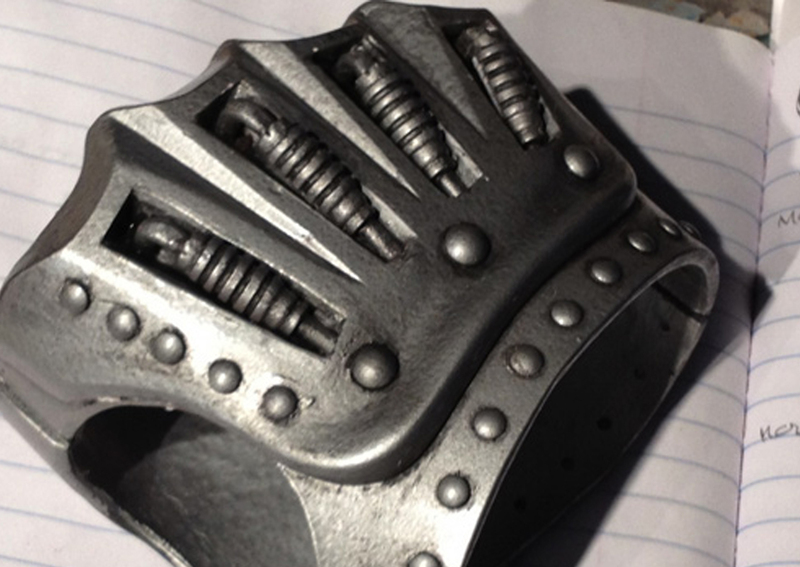 I glued on the piping and the flaws in it gave it a cool hand forged look…as if I had actually planned for it. For the cocking mechanism frame, I cut strips of 1/4” acrylic and made all the appropriate screw holes and slots. 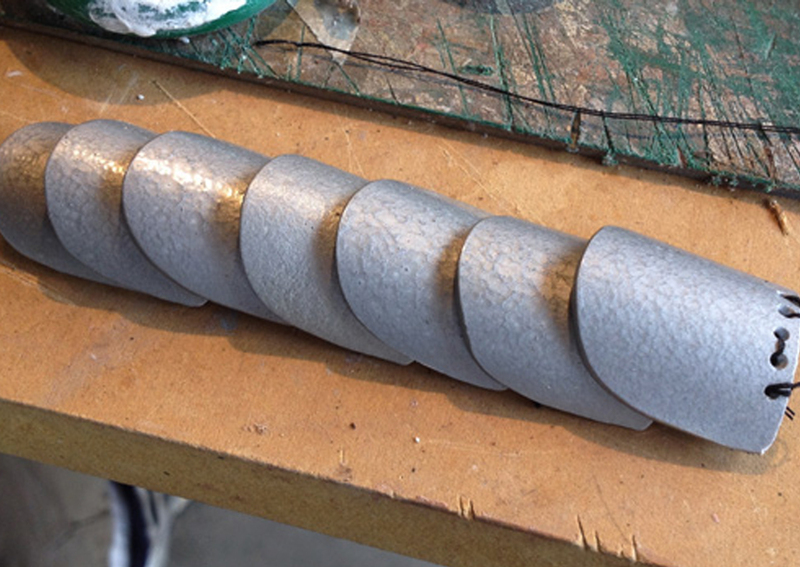 For the large rivets all over the vambrace, I used paper brads. I drilled a slot where I wanted a rivet, dropped some glue in the hole and then inserted the metal prongs. With most of the major construction done, a coat of primer allowed me to do final cleanup. To keep it closed, I consulted my friend Giles who works at the Royal Armouries Museum in Leeds, England. He was able to supply me with lots of photos of actual armor and how they closed. I used a modified approach and used a rivet to create a pin on one side that would go into a depression on the other side, holding it closed. The pressure of your arm in the vambrace keeps it from slipping out. Now it was time to make the gauntlet. 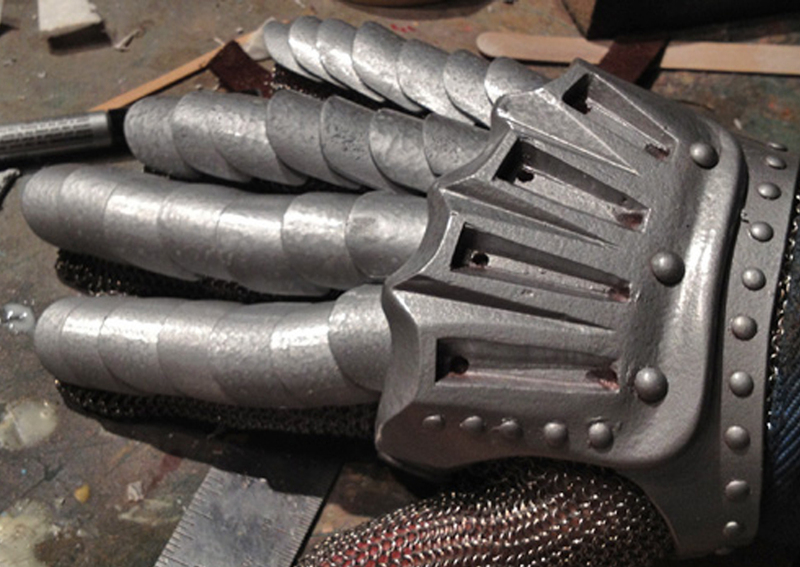 I wanted to finish this within my natural lifespan so I bought a meat slicing chain mail glove for the base of the gauntlet. I cut some posterboard for a template to cut the plate sections. 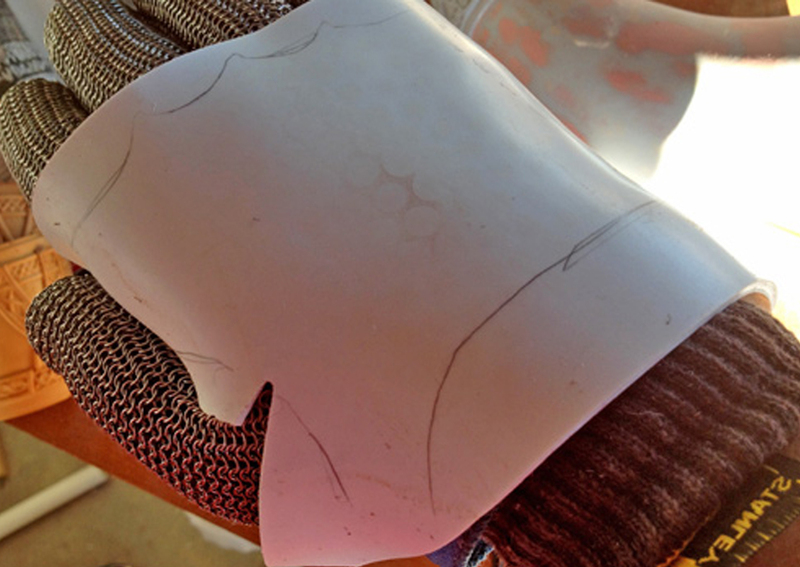 Wearing a knit glove under the chainmail to insulate me from burns, I heated some thick plastic and wrapped it over the back of my hand. I repeated this process for the inside of my hand. I added hinges to one side and used the vambrace pin enclosure method to keep the hand plate closed. I heated more plastic and made the plate for the back of the hand. 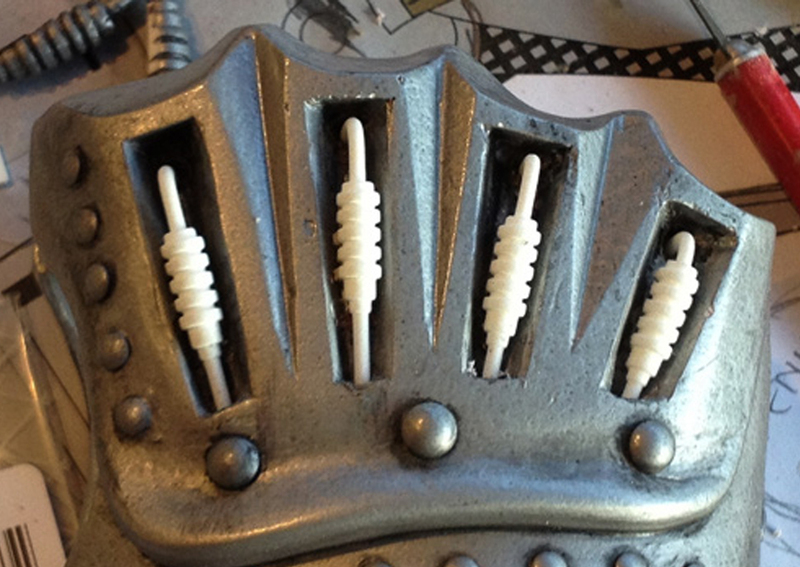 I cut nail heads to act as rivets along the edges of the hand plate. To make the compartments that contain pistons on the back of the hand, I framed out the boxes in styrene and used epoxy putty to build up the inner and outer edges. 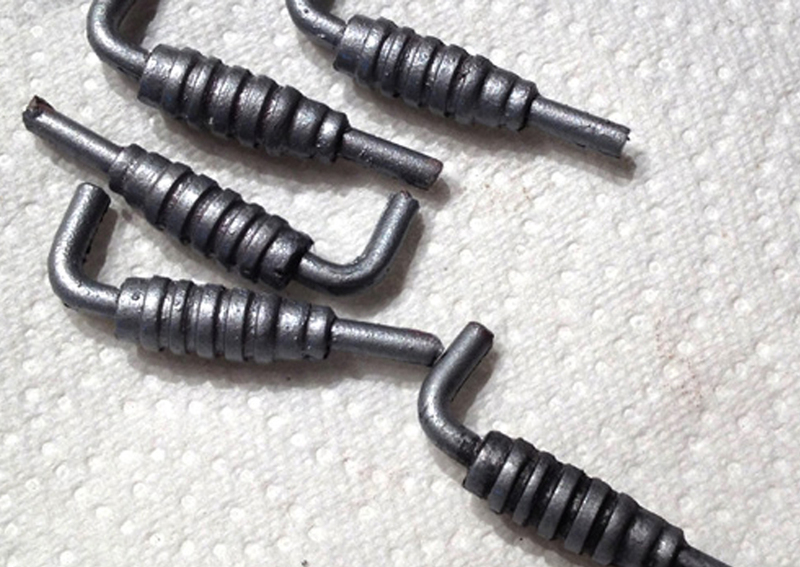 More nails disguised as rivets. 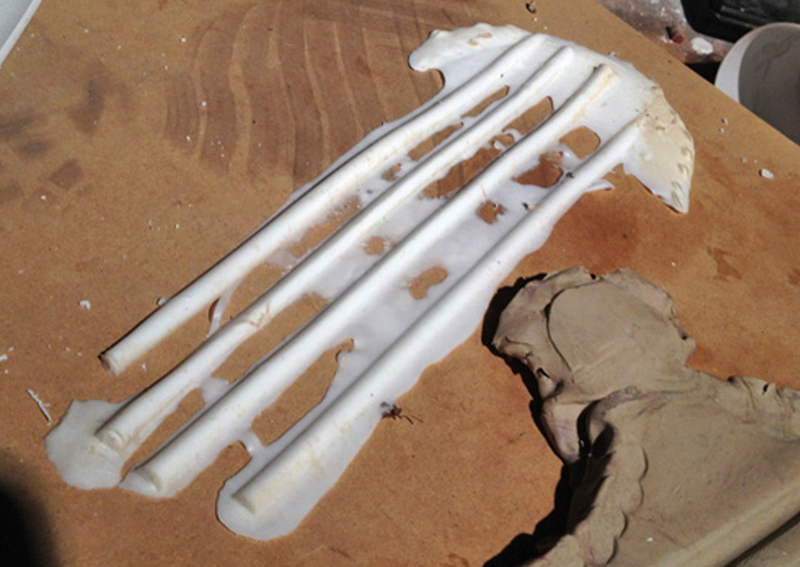 I heat formed some thinner plastic over a dowel and then cut sections for the finger plates. The plates were painted with Rustoleum hammered silver paint, drilled some holes to mount them and then stitched them to leather strips. Each finger got seven plates so I had to be careful when I sewed them on to keep even spacing. 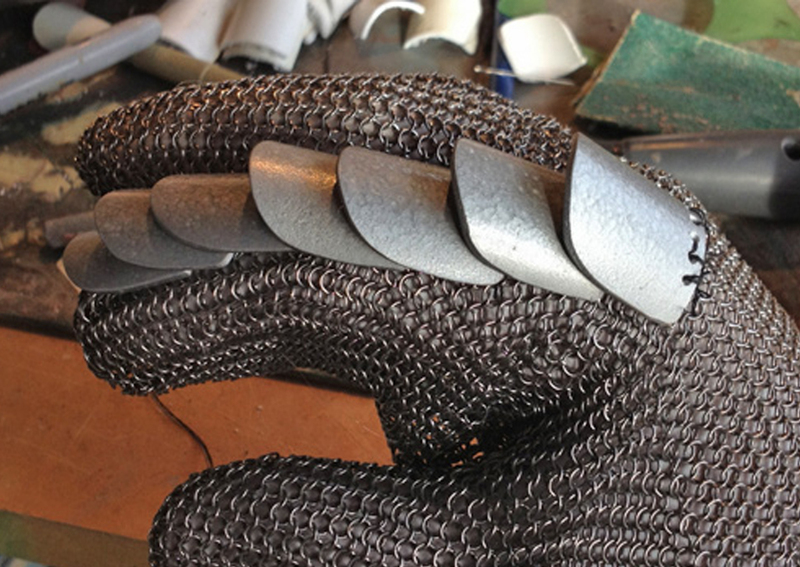 I then hot glued the strip on to each finger of the chain mail glove. A quick test fit of the painted hand plate over the completed fingers. The thumb had a special plate over the knuckle that would have to be fabricated. I made a few attempts at making the ridges with putty but they didn’t have that “hammered over a form" look. I decided to hot glue some half round piping over a MDF dome and vacuum form over it. 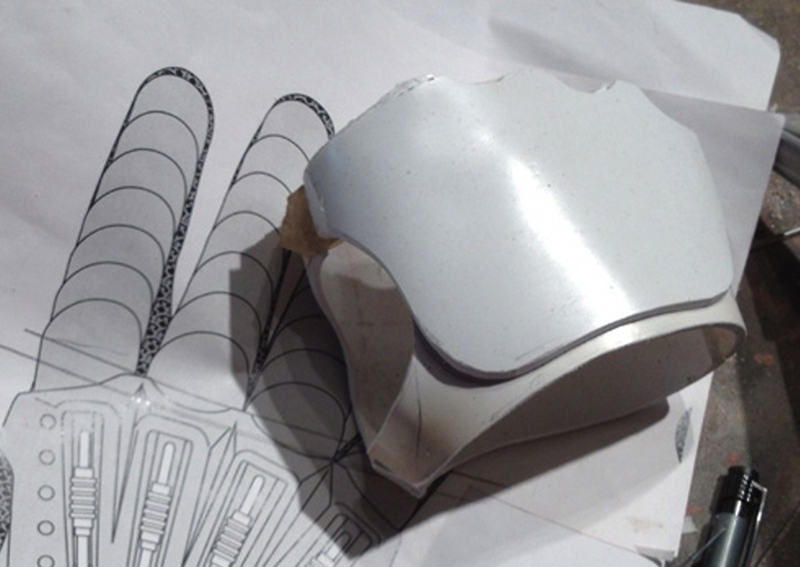 Since this was a one-off piece, I didn’t bother to make the form look nice…it just wouldn’t show in the final plastic. I used a (filthy) scrap piece of .04 styrene and it seemed to capture just enough detail. Fortunately, both plate and buck survived the process and once it was trimmed out, it was ready for painting. I took two longer finger plates, sewed them to a leather strip and then glued the assembly to the glove. 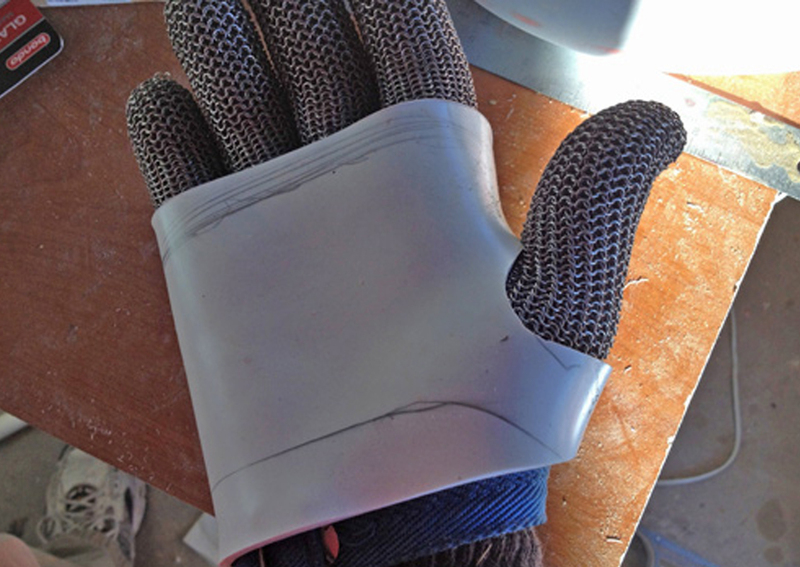 I then sewed the thumb plate directly to the chainmail. A master piston was created by lathing grooves into a plastic tube and slipping it over a bend brass rod. I made a mold and cast 4 copies in resin. The pistons where painted and given a wash of black acrylic to bring out the detail. Sharp-eyed readers will notice an extra piston. It never hurts to make extra as long as you’re at it. You never know when a knife will slip and screw up a part. I glued in the pistons after giving the glove a wash of black acrylic. It really added depth to the boxes where the pistons sit. I looked for metal bar stock for the hinged metal brace that attached to Ash’s arm but everything was too thick or too thin. 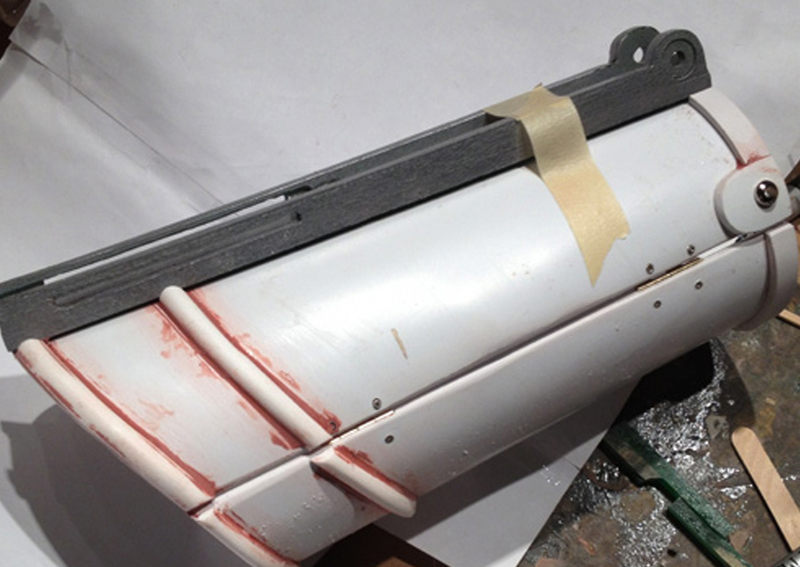 I eventually decided to use thick styrene and paint it to match the other parts. I hinged it with a screw post. I bought some leather straps and attached buckles to them. I search high and low for the buckles they used in the movie but I couldn’t find a match. The client wasn’t that concerned with screen accuracy so he approved these. A quick test fit allowed me to punch holes for the buckles to accommodate a range of arm thicknesses. To make the cocking arm on the vambrace, I bent a 1/8" thick bar of aluminum and added a strip of steel with a pop rivet for the side pistons to attach. For some reason I didn’t take pictures of the mechanism, but here is the final result. I used two torsion springs around the main axle to make the arm return to a close position. It’s not very strong but it’s strong enough to keep it closed. The arm in an open position. The ends of the side pistons (actually steel tubing with a plastic tube collar) were attached to a bar that slides along the groove. The client felt that the hand pistons were stick up too far from their boxes so I 3-D modeled a smaller, thinner piston and had copies 3-D printed at Shapeways. Honestly, I should have done it this way the first time. Much, much faster and cleaner. You can see how much better the printed piston fits in the box compared to the old ones. A shot showing a test fit of the new pistons. 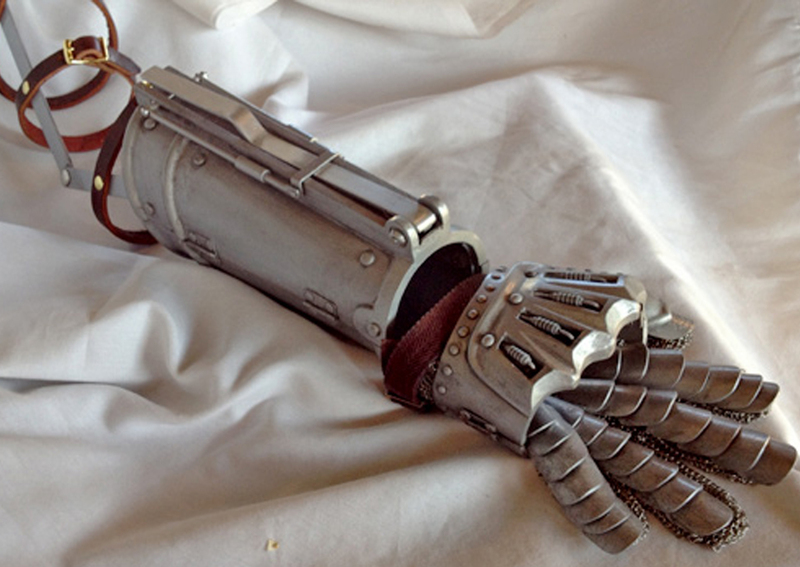 The final Army of Darkness mechanical hand…ready to wear and smite deadites!